First, we here at Acronym Finder send our best wishes to everyone -- have a Happy Holiday season, and a wonderful 2008! We very much appreciate your contributions, suggestions, feedback, and visits to Acronym Finder during 2007. We thank you for helping us be the best, most complete database of abbreviations and acronyms on the planet! "provide children around the world with opportunities to explore, experiment, and express themselves. To that end, OLPC is designing a laptop, educational software, manufacturing base, and distribution system to provide children outside of the first-world with otherwise unavailable technological learning opportunities." Recently, OLPC started its Give One Get One (G1G1) program. 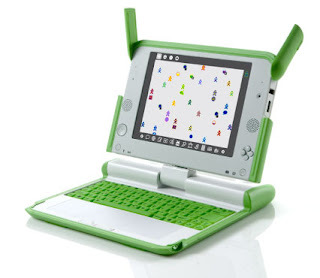 You pay $400 for two laptops, one of which will be sent to benefit a child in one of the OLPC target areas in the world, and the other XO is sent you. In the US, you can take a charity deduction for about half this amount, plus, T-Mobile is offering a one year subscription to its T-Mobile Hotspots. We ordered an XO laptop at the beginning of the G1G1 program and just got it last week. We're very impressed with it! It may look and feel a little like a toy, but it's a fully functional laptop with wireless connectivity and a surprising amount of power for the size and price. And we feel good about contributing a laptop to a child who can benefit from it. If you're interested in the G1G1 program, hurry, as the program ends on December 31, 2007!